The SPARKS project has at its disposal a number of world-class evaluation and demonstration facilities. If you are interested in knowing more about how we use these demonstration facilities in the project’s activities, please feel free to get in touch. AIT SmartEST is a laboratory infrastructure for smart grid component tests and system integration. It has a central role for Austrian smart grid research and is one of only very few laboratories in the world that is able to perform complex Power-Hardware-in-the-Loop (P-HIL) experiments for power systems. It is specialized in inverter tests, system tests with multiple components and environmental tests. The lab features advanced possibilities to combine simulation and experimental validation. Its applications range from research, design and validation environment for smart grids, component development, analysis of automation and communication concepts to design and verification of smart grid systems. The Nimbus microgrid integrates an electrical microgrid and a thermal system. 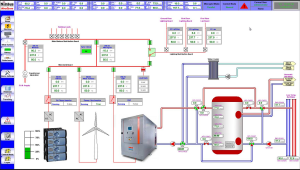 The test bed is controlled by following a hierarchical control strategy ranging from local controllers of subsystems to power system coordination and energy optimization. Such a small-scale power plant requires a hierarchical control strategy to assure the optimal operation of all of the sub-systems, and involves a multidisciplinary approach which includes information and communication technologies (ICT), power systems, power electronics, controls and optimization, and diagnostics. SWW is responsible for electricity, gas, water, heating and telecommunication supplies. Overall, the SWW supplies approximately 20,000 inhabitants in Wunsiedel and beyond. Wunsiedel is situated in northeast Bavaria, Germany. For years, SWW and its subordinated service companies have been focusing on the consistent production, use and expansion of renewable energy and sustainable technologies (e.g., solar and wind energy, co-generation, wood as raw material). In the future, the regionally required energy will largely be generated and consumed on the basis of renewable energy. The main midterm energy purposes of the city Wunsiedel and SWW are energy self-sufficiency as well as the decoupling from the national and international energy markets by synchronizing and decentralizing energy production and distribution.